According to the final Abacus Data survey of the 2011 election, the Conservative Party is headed towards victory although it is unclear whether it will be a majority or minority government. Nationally, the Conservative Party was the choice of 37% of decided voters while 32% of respondents said they would vote NDP. The Liberal Party was at 18%, followed by the Bloc Quebecois and Green Party at 7% respectively. Ten percent of respondents were undecided after being asked if they are leaning towards any one party. In Ontario, the Conservatives are well up on the NDP with 41% of decided voters saying they would vote Conservative. The NDP was at 29% while the Liberals were at 25%. Much of the NDP rise in the polls is due to its growth in Quebec. The NDP now leads the Bloc Quebecois by 13-percentage points with the NDP at 40% and the BQ at 27%. The Liberals are at 14% and the Conservatives 13%. “Quebec is now NDP territory and depending on the vote splits across the province and the NDP’s ability to turnout their vote, there could be a major turnover in seats,” said Coletto. 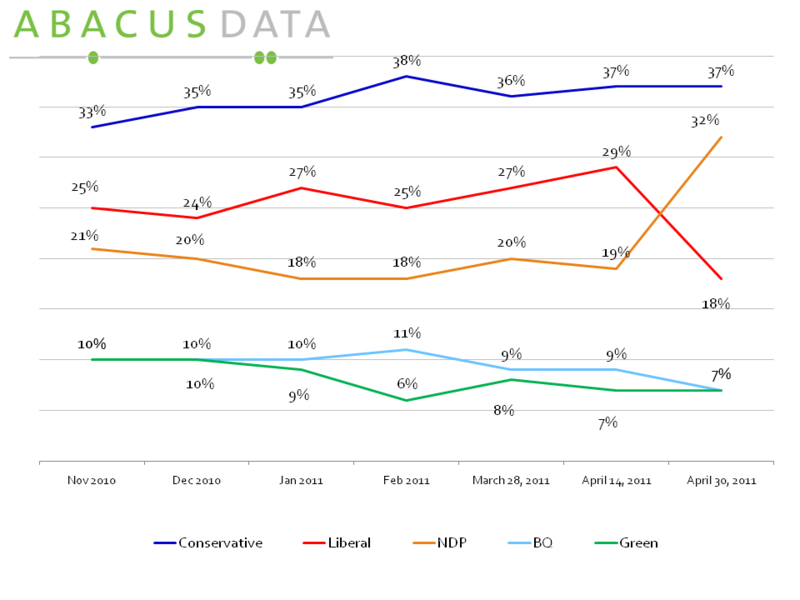 The Abacus Data survey also asked voters their impressions of the federal party leaders. Layton remains the most popular leader in Canada with 55% of respondents saying they have a favourable impression of the NDP leader. Stephen Harper was next with 33% indicating they have a favourable impression of him while Michael Ignatieff’s favourable ratings has dropped significantly since mid-way through the campaign to 18%. Respondents were also asked whether Stephen Harper and Michael Ignatieff should resign if they do not achieve their goals. Fifty-eight percent of respondents believed Stephen Harper should resign as Conservative Party leader if he fails to win a majority while 73% of respondents believed Michael Ignatieff should resign as Liberal Party leader if he fails to win more seats. Finally, respondents were asked to comment on Elections Canada’s policy regarding transmission of election results by Twitter or Facebook before all polls close on election night. Forty-three percent (43%) said they agreed with Elections Canada’s policy because posted results could influence voting in Western Canada. Thirty-five percent (35%) believed the ban is ridiculous because it cannot be enforced. Another 22% said they agreed with neither position.